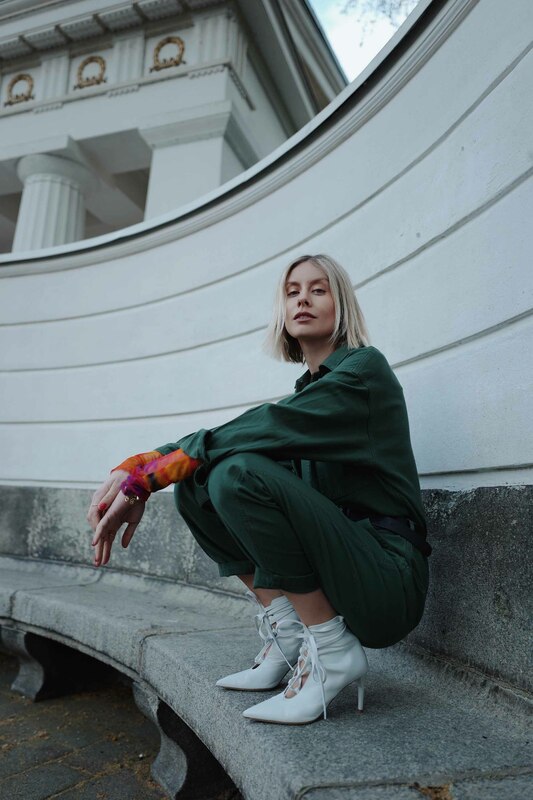 It is no secret that tie-dye is currently taking over every fashion girl’s wardrobe and will be a major must-have for summer. And I have to admit: I totally love it! If you haven’t seen my previous blogpost on how to style a tie-dye sweater yet, make sure to read it here. Tie-dye is currently being interpreted in many different ways. What was originally associated with the hippies, has turned into a MUST for fashion lovers. When you want to play it safe, I recommend to go for a classic and easy look. You can’t go wrong with a combination of tie-dye sweater, jeans and heels. However, I wanted to show you another, more exciting way of wearing tie-dye while pulling off two major spring and summer trends. Over the past few seasons we have seen a change in style and in aesthetics: comfort has definitely become priority. Skinny jeans, heels and tote bags have moved aside for chunky trainers, belt bags and track pants. 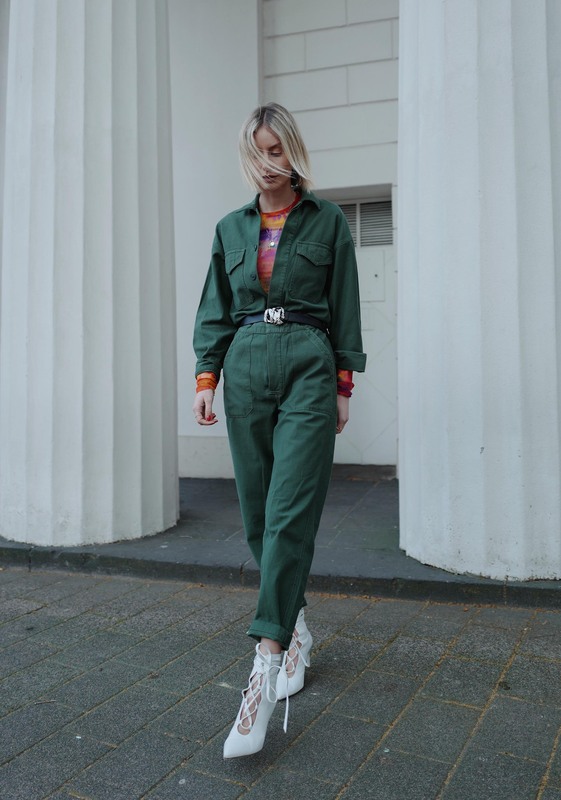 It is therefore no surprise, that the boiler suit is finally taking its place alongside these other comfortable trends. 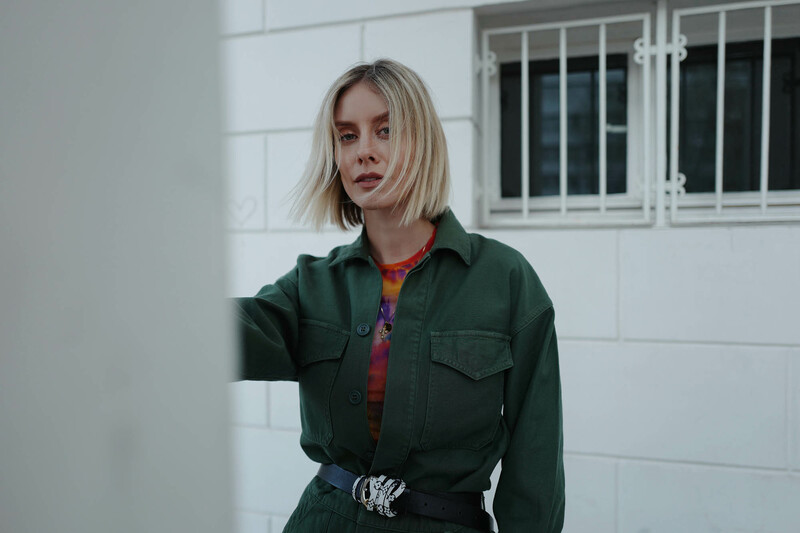 A trend that has its original roots in workwear has managed to develop into my easiest go-to staple. It is reminiscent of a mechanic’s overall, a garment that women wore for the first time during World War II to work in factories. Nowadays it is comfortable, versatile and super cool. A boiler suit is the perfect one-piece. Whereas a jumpsuit tends to be more tailored, a boiler suit has a slightly looser fit. Having its roots in workwear, its typical features include a full zip, chest pockets and a durable fabric. 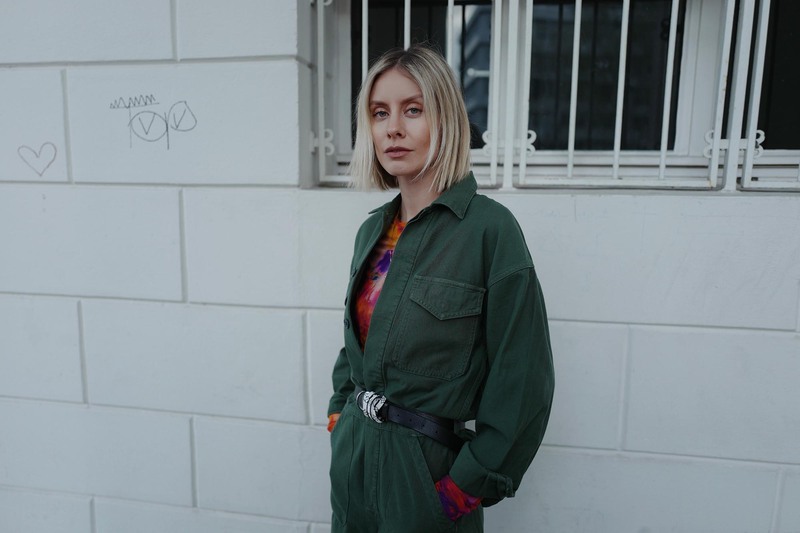 A boiler suit instantly adds ease and coolness to your look. It embodies a unisex image. As if you had just effortlessly borrowed the suit from your boyfriend. The suit stands for potential, empowering women to dress for themselves. I really have to say, pieces with tie-dye patterns are surprisingly easy to combine. Especially when you keep your outfit simple and choose neutral pieces. I love khaki. It is such a timeless and neutral color that can simply go with anything. My Citizens of Humanity boiler suit is perfect for spring. It is made of pure cotton and comes along with long sleeves and a straight leg. Large chest pockets and a classic collar complete the design. I really love the fact, that you are wearing top and trousers in one. Combining the simple boiler suit with the eye-catching MSGM long sleeve creates a beautiful, harmonious contrast. I love its multi colored print, sheer finish and fitted silhouette. Since I wear oversized shirts and jackets most of the time, it is actually very pleasant to wear something fitted again. 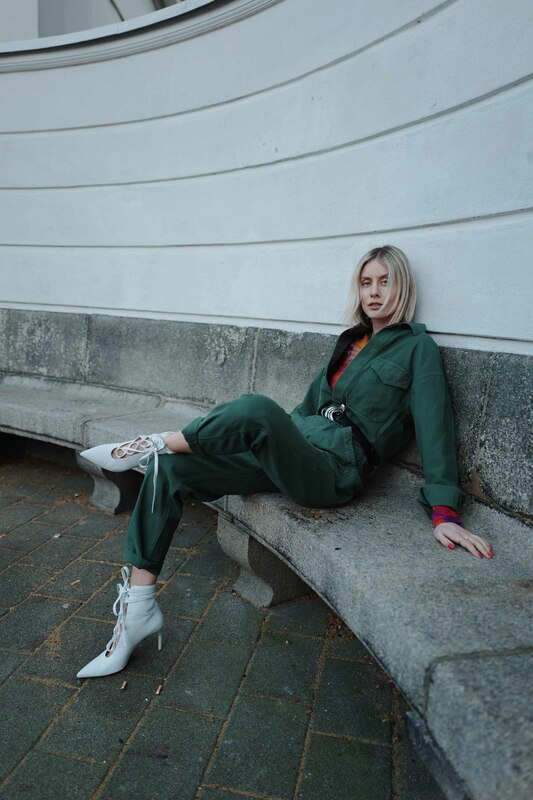 Can you guys tell, that I absolutely love my white Miu Miu booties? I’ve been wearing them non-stop lately and I still have many possible combinations in my mind. White booties are super versatile and great for any kind of spring look.